Darden played all of the positions in the defensive backfield during three varsity college seasons and he intercepted 11 passes, three of which were returned for touchdowns, the longest covering 92 yards. He received All-American recognition from four organizations as a senior and was chosen by the Browns in the first round of the 1972 NFL draft (18th overall). Darden moved directly into the starting lineup at strong safety and played well, intercepting three passes, as well as returning punts. He was shifted to free safety, where his speed could be better utilized, and intercepted 8 passes in 1974 in addition to returning a fumble for a TD. However, Darden missed the entire 1975 season due to a major knee injury suffered in the preseason that required surgery. He came back strong in ’76 to intercept 7 passes and had 6 in 1977, one of which he ran back for a score. Browns went 8-8 to finish third in the AFC Central. 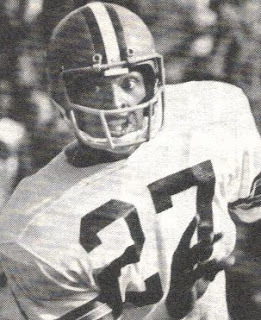 Darden played another three seasons with the Browns, through 1981. Good in pass coverage, he was also capable against the run. He ended up intercepting 45 passes, making him Cleveland’s career leader, two of which he returned for touchdowns. He also returned 45 punts for a 6.3-yard average. His Pro Bowl selection in 1978 was the only one of his career, although he did receive second-team All-NFL honors from the Pro Football Writers in 1976 and the Associated Press in ’79.